To learn more about the ancient Pharaoh Hakotep I and the secretive cult that wants to revive him, the heroes travel to the city of Tephu to explore the vast archives in its Great Library. This is no small task, as they must contend with those who wish such knowledge to remain forgotten. With the clues they discover, the heroes venture deep into Osirion's uncharted deserts in search of the tomb of Hakotep's master pyramid-builder. There they face not only dangerous denizens of the desert, but the cult of the forgotten Pharaoh - cultists who will stop at nothing to ensure their god-king remains undisturbed. 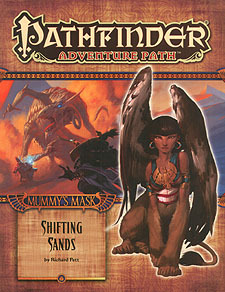 "Shifing Sands," a Pathfinder RPG adventure for 7th-level chracters, by Richard Pett. A gazetteer of the city of Tephu, the City of the Reed People, by Richard Pett. A study of the rituals of mummification, by Russ Taylor. Ancient secrets and deadly kidnappers in the Pathfinder's Journal, by Amber E. Scott. Five new monsters, byt Benjamin Bruck, Adam Daigle, Thurston Hillman, Michael McCarthy, and Patrick Renie.